Philippe Gilbert (born 5 July 1982) is a Belgian professional road bicycle racer, who currently rides for UCI WorldTeam Deceuninck–Quick-Step. Gilbert is best known for winning the World Road Race Championships in 2012, and for being one of two riders, along with Davide Rebellin, to have won the three Ardennes classics – the Amstel Gold Race, La Flèche Wallonne and Liège–Bastogne–Liège – in a single season, which he accomplished in 2011. Gilbert also finished the 2011 season as the overall winner of the UCI World Tour. A Classics specialist, Gilbert has won several classic cycle races, including Paris–Tours twice (2008, 2009), the Giro di Lombardia twice (2009, 2010), the Amstel Gold Race four times (2010, 2011, 2014, 2017), La Flèche Wallonne (2011), Liège–Bastogne–Liège (2011), the Clásica de San Sebastián (2011), the Tour of Flanders (2017), and Paris-Roubaix (2019). He is the second person (and first Belgian) in history to win all three Ardennes classics in a single year. In 2017, Gilbert became the third rider after Eddy Merckx (1975) and Jan Raas (1979) to win both Ronde van Vlaanderen and Amstel Gold Race in the same year. He has also won stages at each of the three cycling Grand Tours: three stages at the Giro d'Italia (one in 2009 and two in 2015), one stage at the Tour de France (in 2011), and five stages at the Vuelta a España (two in both 2010 and 2012, and one in 2013). Gilbert currently resides in Monaco-Ville, with his wife Patricia, and their sons Alan (b. 2010), and Alexandre (b. 2013). Gilbert's younger brother Jerome has also been a racing cyclist. Born in Remouchamps in the municipality of Aywaille, Gilbert turned professional in 2003 by joining FDJeux.com after riding as stagiaire for the team in late 2000. During this season he recorded his first victory by winning a stage in Tour de l'Avenir. In 2004 he began by winning a stage in the Tour Down Under as well as the young rider classification. He participated in the men's road race at the 2004 Summer Olympics where he finished 49th. He also won the Paris–Corrèze. In 2005 he won several races in France, which allowed him to win the Coupe de France de cyclisme sur route. These victories included Trophée des Grimpeurs, Tour du Haut-Var and the Polynormande. He also took stages in Four Days of Dunkirk and Tour Méditerranéen. 2006 would become his most successful year thus far when he won the prestigious Omloop Het Volk after repeatedly attacking until he got away alone with 7 km to go. During the season he also won Grand Prix de Fourmies and Grand Prix de Wallonie as well as stages at Dauphiné Libére and ENECO Tour. In early 2007 he had a skin cancer lesion removed from his thigh. Because of this he had to delay the start of his season. That did not stop him from trying himself during Milan–San Remo, where he managed to escape on the Poggio with Riccardo Ricco before being captured 1200 meters from the finishing line. He could not get any victory during the season until Tour de Limousin, where he claimed his only victory in 2007 by winning a stage. In Paris–Tours he was caught with 500 meters to go along with Karsten Kroon and Filippo Pozzato. Gilbert started 2008 by winning the King of the Mountains competition at the Tour Down Under and the overall classification as well as two stages of the Vuelta a Mallorca. He also finished third in the Milan–San Remo, accomplishing his first podium in a monument. He later won Het Volk for the second time in his career after a solo attack with almost 50 kilometers to go. Four days later he won the GP Samyn. He finished the year by winning the classic Paris–Tours race in a late breakaway where he won a sprint between his three breakaway companions. The peloton finished four seconds back. In 2009 he joined Silence–Lotto to lead the Belgian team in the classics, finishing third at Tour of Flanders and fourth in both Amstel Gold Race and Liège–Bastogne–Liège. He also took his first stage in a Grand Tour by winning the 20th stage of the Giro d'Italia and won a stage and the overall classification of the Ster Elektrotoer. Later in the season he repeated his Paris–Tours win, attacking on the last climb with Tom Boonen and Borut Božič before outsprinting them to the line. A week later, he also won the prestigious Giro di Lombardia after escaping from the peloton with Samuel Sánchez, beating him to the finish by a half-length. It was his fourth consecutive victory in 10 days after also winning the Coppa Sabatini, Paris–Tours and Giro del Piemonte. At the end of the season he was awarded the Flandrien of the Year award, recognizing him as the best Belgian rider of the year. In 2010 he won his first classic of the year, Amstel Gold Race, in April. After an aggressive race featuring many attacks, he won through a big attack in the last 500 meters of the climb to the finish, comfortably winning by several bike lengths from the peloton. He also won the first stage of the Tour of Belgium. Gilbert then ended the 2010 season in superb form. He followed up two stage wins in the Vuelta a España with victories in the Giro del Piemonte and the Giro di Lombardia, repeating his 2009 wins in both races. The Giro di Lombardia was won with a solo attack in atrocious weather conditions. In 2011, Gilbert won the Montepaschi Strade Bianche, a race including 70 kilometres of gravel roads. He then had a quadruple consecutive win: first he won the Brabantse Pijl, then he repeated as winner of Amstel Gold Race, breaking free on the Cauberg. Three days later, he won La Flèche Wallonne dropping his rivals on the final climb of the Mur de Huy and finally he won Liège–Bastogne–Liège beating the Schleck brothers in the sprint. Gilbert thus became the second rider, after Davide Rebellin in 2004, to win the three Ardennes classics in a single year. During the first half of the season he also won stages at the Volta ao Algarve, Tirreno–Adriatico as well as the overall classification and a stage of both the Tour of Belgium and Ster ZLM Toer. Gilbert at the 2011 Tour de France, wearing the Belgian national champion's jersey. In late, June Gilbert won the national road race championships. In July he would take the opening 191.5 km stage of the Tour de France, winning by three seconds over Cadel Evans, allowing him to be the first person to put on the yellow jersey as overall leader. He lost that jersey in the team time trial the next day but still held the green jersey and the polka dot jersey after stage two. A week after the end of the Tour, Gilbert won the Clásica de San Sebastián, and in mid-August, Gilbert won the 3rd stage at the ENECO Tour, taking his 15th victory of the year. In September, Gilbert won the Grand Prix Cycliste de Québec and took over the lead of the UCI world rankings by raking in the 80 points allowed to the victor. He followed that performance two days later at the Grand Prix Cycliste de Montréal by finishing on the third step of the podium, despite stating that he felt "no pressure" after his Quebec City victory. With that placing, Gilbert deposited another 50 UCI points in his account. He would race in the October Italian classic, the Giro di Lombardia, taking eight place after he was distanced on the final climb. He eventually closed the season well ahead in the UCI World Tour rankings, with 718 points as his closest competitor Cadel Evans had garnered 584 points. He won 18 races in the season, more than any other cyclist in the professional peloton. Gilbert was appointed as a member of the inaugural UCI Athletes' Commission in 2011. In 2012, Gilbert signed for BMC Racing Team on a three-year contract reportedly worth three million euros annually. His goals for his new squad were to perform highly in the Spring classics and help his team-mate Cadel Evans repeat his 2011 feat of winning the Tour de France. Neither of those came to fruition, as Gilbert's best result in the one-day spring races was third of La Flèche Wallonne, where he got deposited on the final climb by Joaquim Rodríguez who won atop the historic Mur de Huy with a slim margin of 4 seconds. Three days prior, he took sixth position at the Amstel Gold Race and was pleased to achieve a top ten ranking in the Ardennes' race. He missed out on his goal to bring Cadel Evans in yellow to Paris and his best placing in a Tour de France stage was fourth. He also lost both of the Belgian National Championship titles he held, the Road Race and the Individual Time Trial, finishing on the third step of the podium for the latter. On 26 August 2012, Gilbert finally managed his first victory of the season by winning the ninth stage of the Vuelta a España after breaking away together with Joaquim Rodríguez. He later won a second stage of the race, winning stage nineteen on 7 September. On 23 September 2012, Gilbert won the UCI Elite Men's Road Race world championship and the rainbow jersey, ahead of Edvald Boasson Hagen and Alejandro Valverde by producing a massive surge on the final climb of the Cauberg. In 2013, Gilbert headed towards the World Championships without a single win in the rainbow jersey, in danger of his first winless season since turning professional in 2003. He started the Vuelta hoping that the competition would, for the second successive year, kick-start his season. After being narrowly defeated in a sprint by Zdeněk Štybar on stage 7, Gilbert finally clinched a victory in the rainbow stripes when he caught and passed Edvald Boasson Hagen to win stage 12. In 2014, Gilbert picked up his previous form when in the spring he won his second Brabantse Pijl and his third Amstel Gold Race. Gilbert finished third of the Brabantse Pijl, seconds after his teammate Ben Hermans. At the Amstel Gold Race, Gilbert could not repeat his winning ways of 2014 and came in tenth after having attacked on the final climb of the day, the Cauberg. On the next Wednesday, Gilbert crashed out of the La Flèche Wallonne. He then took part in Liège–Bastogne–Liège even though he was slightly injured and held on to the main group until the Côte de Saint-Nicolas, where he was dropped and finished 36th. He raked in his first victory of the season at the Giro d'Italia, besting the lead group on a sharp incline at the end of Stage 12. He repeated on Stage 18, where he participated to the early break. After being dropped on the last climb of the day, he came back on the remnants of the breakaway after the descent and attacked them to win solo. Gilbert took his first victory of the season in February at the one-day race Vuelta a Murcia, winning the sprint of a four-man group. He won the Belgian National Road Race Championships in June. After 4 seasons with BMC, Gilbert joined Quick-Step Floors for the 2017 season. Gilbert finished second in the Dwars door Vlaanderen behind teammate Yves Lampaert. The pair made the race-defining split along with Alexey Lutsenko from the Astana team, and Orica–Scott's Luke Durbridge before Lampaert attacked with 7.5 kilometres (4.7 miles) remaining and ultimately won the race by 39 seconds ahead of Gilbert, who led home Lutsenko and Durbridge in a sprint for second place. Later that week, in a three-up sprint finish of Belgian riders, Greg Van Avermaet (BMC Racing Team) won E3 Harelbeke ahead of Gilbert and AG2R La Mondiale's Oliver Naesen. The following week, Gilbert won the Three Days of De Panne after he attacked on the Muur van Geraardsbergen during the race's opening stage and soloed away to the victory by 17 seconds from his nearest competitor. He ultimately won the race by 38 seconds ahead of Trek–Segafredo's Matthias Brändle, and also won the sprints classification, primarily from his opening-day attack. Three days later, he won the Tour of Flanders after a solo attack on the Oude Kwaremont and holding off the rest of the field over the remaining 55 kilometres (34 mi). Gilbert became the first rider in twenty years to win both the Tour of Flanders and Liège-Bastogne-Liège in his career. Two weeks after that he won the Amstel Gold Race for a fourth time and became the third rider to win the Tour of Flanders and Amstel Gold Race in the same year. The other two are Jan Raas and Eddy Merckx. It was later revealed that he won the race despite riding for the last 130 kilometers of the race with a minor kidney tear. The injury required treatment in hospital after the race, and ruled him out of Fleche Wallonne and Liege-Bastogne-Liege. In April 2019, Gilbert won Paris-Roubaix in a sprint ahead of Nils Politt, thereby raising his career’s total number of monument titles to five. This table shows Gilbert's results in the great classics and the World Road Race Championships. Gilbert was accused of abusing cortisone by an anonymous former Lotto teammate during his dominant period with Omega Pharma–Lotto, an allegation which the Belgian vehemently denies. ^ "Gilbert honored as "Boar of Ardennes" in Aywaille". Cycling News. Future Publishing Limited. 27 October 2012. Retrieved 3 January 2013. ^ a b "Philippe Gilbert profile". Archived from the original on 27 December 2013. Retrieved 27 December 2013. ^ Torrego, José María (23 December 2018). "El Deceuninck Quick Step busca no sucumbir del cetro mundial del ciclismo en 2019" [The Deceuninck Quick Step seeks not to succumb from the cycling world title in 2019]. La Guía del Ciclismo (in Spanish). Digipress Ibérica SL. Retrieved 2 January 2019. ^ "Belgium's Philippe Gilbert blasts to men's road race victory on the Cauberg". The Daily Telegraph. Telegraph Media Group. 23 September 2012. Retrieved 3 January 2013. ^ Atkins, Ben (25 April 2011). "Philippe Gilbert's Ardennes triple lifts him to World number one spot". VeloNation. VeloNation LLC. Retrieved 3 January 2013. ^ "UCI presents Philippe Gilbert with 2011 WorldTour trophy at Peace and Sport International Forum". VeloNews. Competitor Group, Inc. 29 October 2011. Retrieved 3 January 2013. ^ "Philippe Gilbert, papa pour la seconde fois: Alexandre est né ce vendredi" [Philippe Gilbert, a father for the second time: Alexandre was born on Friday]. LaProvince (in French). Copiepresse. 17 May 2013. Retrieved 27 May 2013. ^ "Gilbert's brother to ride Liege-Bastogne-Liege". Special Broadcasting Service. 13 April 2012. Retrieved 24 July 2013. ^ 61st Omloop Het Volk – 1.HC. Autobus.cyclingnews.com (2006-02-25). Retrieved on 2011-12-23. ^ Gilbert undergoes skin cancer surgery. Autobus.cyclingnews.com. Retrieved on 2011-12-23. ^ Hood, Andrew (30 May 2009). "Philippe Gilbert wins 2009 Giro d'Italia stage 20; Denis Menchov holds lead". Velonews.com. Retrieved 28 June 2011. ^ vrt (19 October 2010). "Philippe Gilbert is 'Flandrien of the year'". flandersnews.be. Retrieved 28 June 2011. ^ "Amstel Gold Race 2010: Philippe Gilbert ends 16-year wait for Belgian win on the Cauberg". The Daily Telegraph. UK: Telegraph Media Group. 18 April 2010. Retrieved 20 April 2010. ^ Farrand, Stephen (16 October 2010). "Gilbert repeat victor of Giro di Lombardia". cyclingnews.com. Retrieved 28 June 2011. ^ MacLeary, John (24 April 2011). "Liège-Bastogne-Liège 2011: Philippe Gilbert triumphs in Belgium to complete historic Ardennes classics hat-trick". The Daily Telegraph. London. Retrieved 28 June 2011. ^ Haake, Bjorn (26 June 2011). "Philippe Gilbert takes his first Belgian road title with solo move". VeloNation. VeloNation LLC. Retrieved 3 January 2013. ^ Fotheringham, William (2 July 2011). "Philippe Gilbert clinches stage one victory". Guardian. London. Retrieved 4 July 2011. ^ Pasquale Stalter (9 September 2009). "Gilbert wins Quebec City Grand Prix, Gesink Second". Miroir du Cyclisme. Archived from the original on 5 November 2013. Retrieved 15 August 2012. ^ Ben Atkins (12 September 2011). "Philippe Gilbert extends WorldTour lead after Montréal third place". Velo Nation. Velo Nation LLC. Retrieved 15 August 2012. ^ Barry Ryan (15 October 2011). "Gilbert comes up short at Giro di Lombardia". Cycling News. Future Publishing Limited. Retrieved 15 August 2012. ^ Ben Atkins (12 September 2011). "Philippe Gilbert presented with 2011 WorldTour trophy by Pat McQuaid". Velo Nation. Velo Nation LLC. Retrieved 15 August 2012. ^ a b c "Gilbert says other teams responsible for his lack of victories in 2012". Cycling News. Future Publishing Limited. 18 August 2012. Retrieved 18 August 2012. ^ Ryan, Barry (5 March 2015). "UCI Athletes' Commission holds first meeting in Aigle". cyclingnews.com. Retrieved 5 March 2015. ^ "Philippe Gilbert signs for BMC". Cycling News. Future Publishing Limited. 19 August 2011. Retrieved 1 January 2012. ^ "BMC racing team's Gilbert third at La Flèche Wallonne". BMC. BMC 2012. 18 April 2012. Retrieved 18 August 2012. ^ Brecht Decaluwé (15 April 2012). "Amstel Gold Race marks return to form for Gilbert". Cycling News. Future Publishing Limited. Retrieved 18 August 2012. ^ "Vandewalle claims Belgian time trial title". Cycling News. Future Publishing Limited. 15 August 2012. Retrieved 18 August 2012. ^ "Gilbert pakt eerste seizoenszege in Vuelta" [Gilbert takes first season win in Vuelta]. Sporza (in Dutch). Vlaamse Radio- en Televisieomroeporganisatie. 26 August 2012. Retrieved 26 August 2012. ^ "Gilbert slaat opnieuw toe in de Vuelta" [Gilbert strikes again in the Vuelta]. Sporza (in Dutch). Vlaamse Radio- en Televisieomroeporganisatie. Retrieved 7 September 2012. ^ "Philippe Gilbert of Belgium wins men's road race at cycling World Championships". CTN News. Bell Media. Associated Press. 23 September 2012. Retrieved 23 September 2012. ^ Wood, Donald (30 August 2013). "Vuelta a Espana 2013 Results: Stage 7 Standings, Highlights and Recap". Bleacher Report. Retrieved 10 September 2013. ^ "Vuelta a España 2013, stage 12: Philippe Gilbert surges to victory in Tarragona as Vincenzo Nibali defends red jersey". telegraph.co.uk. 5 September 2013. Retrieved 10 September 2013. ^ "Hermans holds off pack for Brabantse Pijl win". Cyclingnews.com. Future plc. 15 April 2015. Retrieved 15 April 2015. ^ "Injured Gilbert fades in Liège-Bastogne-Liège finale". Cyclingnews.com. Future plc. 26 April 2015. Retrieved 26 April 2015. ^ "Results: 2015 Giro d'Italia, stage 12". VeloNews. Competitor Group, Inc. 21 May 2015. Retrieved 22 May 2015. ^ Colin Henrys (28 May 2015). "Giro d'Italia 2015: Philippe Gilbert wins stage 18 as Alberto Contador gains more time". Road Cycling UK. MPORA. Retrieved 29 May 2015. ^ "Philippe Gilbert wins Vuelta a Murcia". Cyclingnews.com. Immediate Media Company. 13 February 2016. Retrieved 13 February 2016. ^ Decaluwé, Brecht; O'Shea, Sadhbh (22 March 2017). "Dwars door Vlaanderen: Lampaert parlays Quick-Step tactics to victory". Cyclingnews.com. Immediate Media Company. Retrieved 22 March 2017. ^ "Van Avermaet wins E3 Harelbeke". Cyclingnews.com. Immediate Media Company. 24 March 2017. Retrieved 24 March 2017. ^ Farrand, Stephen (28 March 2017). "Gilbert strikes first at the Driedaagse De Panne". Cyclingnews.com. Immediate Media Company. Retrieved 29 March 2017. ^ "Philippe Gilbert wins Tour of Flanders after epic solo break". Cyclingnews.com. Immediate Media Company. 2 April 2017. Retrieved 2 April 2017. ^ "Paris-Roubaix 2019: Philippe Gilbert wins fourth different monument as Deceuninck-Quick Step strike gold". The Telegraph. Retrieved 15 April 2019. ^ "Gilbert denies allegations of Cortisone abuse". CyclingNews. Future Publishing Ltd. 16 March 2013. Retrieved 6 October 2013. Gilbert, Philippe (2012). Philippe Gilbert: My Year in Top Gear. Translated by Martin Lambert. Tielt, Belgium: Lannoo Meulenhoff. ISBN 9789401401593. Retrieved 5 November 2013. 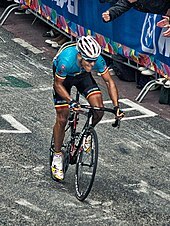 Wikimedia Commons has media related to Philippe Gilbert.